History: US Nationals winner in 1931. Bill Luders' own boat and was often in the hunt on Long Island Sound in the 30's. Work continues at Brion Rieff's up in Maine. 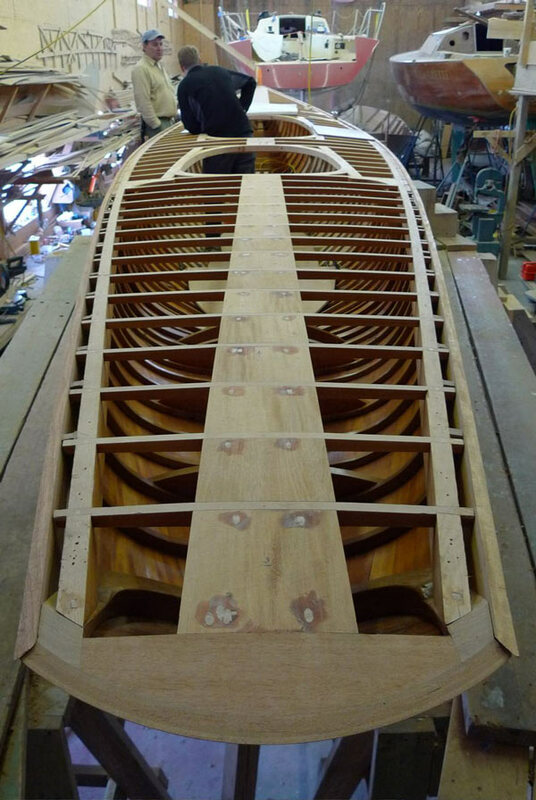 Totem has received all new mahogany planking and is now going to receive a new pine deck, which will be covered with canvas. 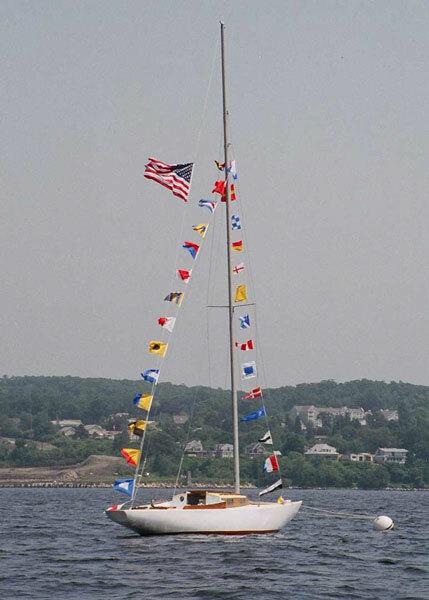 She will also receive a new wood mast and will be in the running for the Baum + Koenig Trophy at the 2009 World Cup in Newport, Rhode Island. Hmmm. What color to paint her? 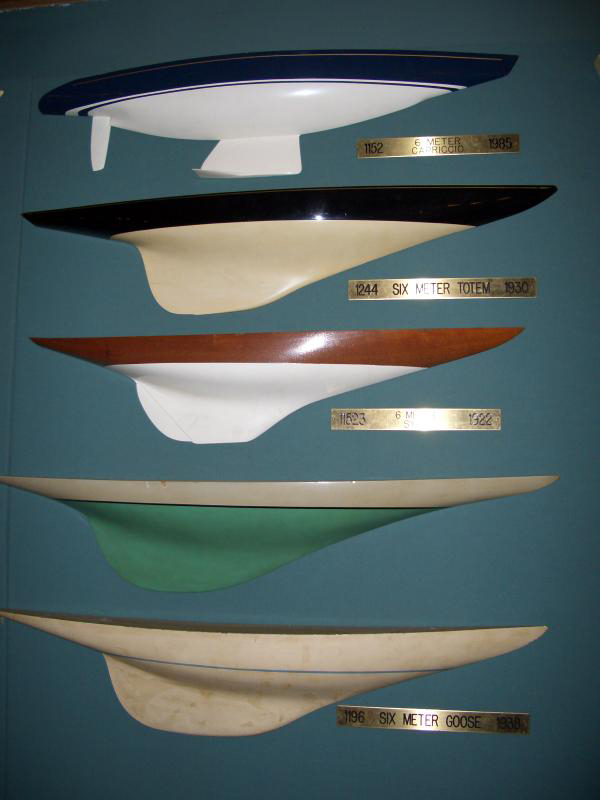 The boat has certainly been white in the past, and was known to be yellow while on Lake Ontario and a little below is a black painted half hull of Totem on the wall in the New York Yacht Club's model room. Could her black color here be a statement in reaction to Nathaniel Hereshoff, who, when asked this question replied, "There are only 2 colors to paint a boat; either white or black, and only a fool would paint a boat black." The images below show US 51 Totem, post launch, alongside US 53 Cherokee at Casey's Marina in Newport. 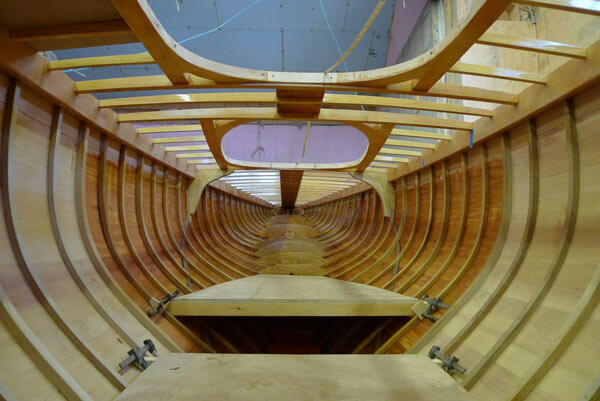 Cherokee and Totem at Casey's Marina in Newport, R.I.
Totem now has all new mahogany planking, oak frames and floors. I thought I might share an update of Totem. 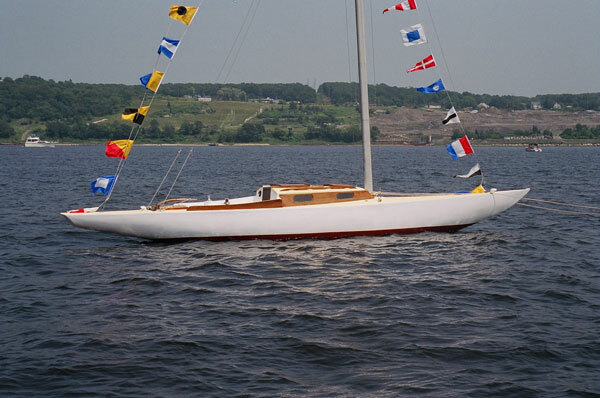 I have purchased her from Toby Rodes and now have her down at Concordia, in Dartmouth, MA. 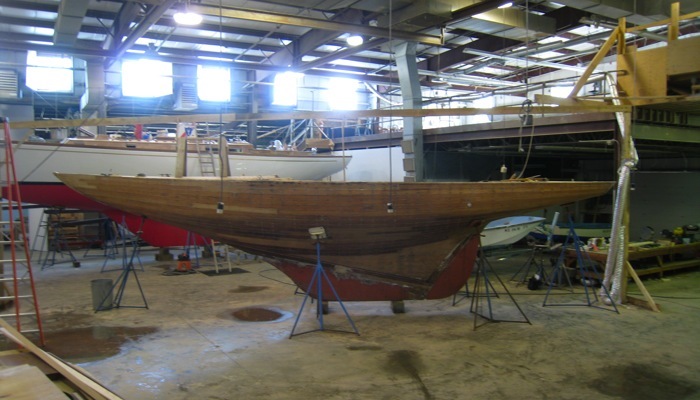 She is presently being restored by a team from Concordia, Jacob Vargish, and myself. I have created a blog, http://web.mac.com/annice/iWeb/Site%203/Blog/Blog.html . She was launched June 30th, landing in US water for the first time sinceroughly 1938 (not counting a couple trips to Rochester from Toronto in the 50s). We under took a refit since she had lost her rig last fall cracking open the port rail, bending chainplates and damaging planks and frames from a pounding rig. 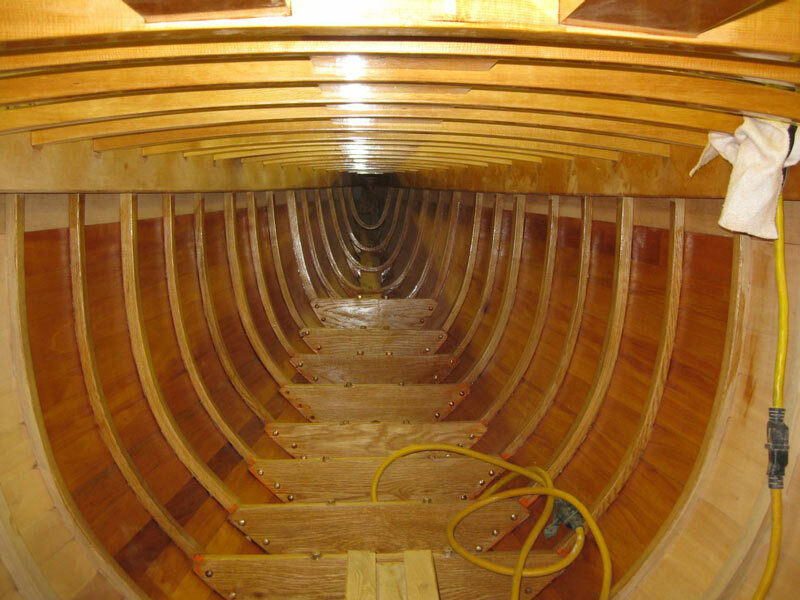 We cleared her of all deck gear and refitted her with the rig from N 30 Hanko (she unfortunately perished in a collapsing barn after heavy snowfall in Seattle, Kurt McKenzie's boat, many thanks to Kurt). 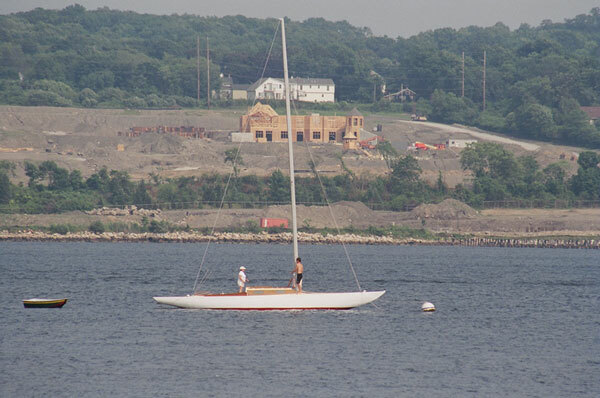 With help from many friends in and around the Rhode Island sailing industry, we strengthened her, fitted the new rig and are awaiting a set of lowers to put her through the paces. 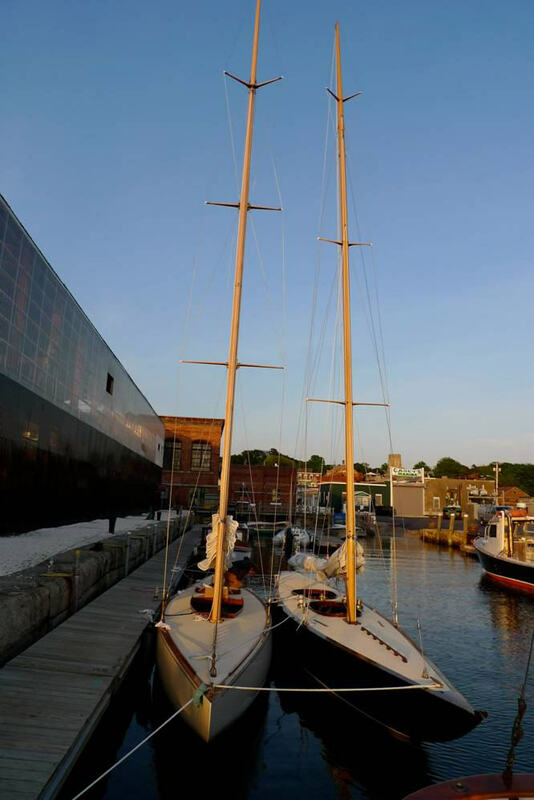 She is floating nicely behind our home on the northern tip of Aquidneck Island (Newport), no leaks and ready to slice through the waters of Narragansett Bay, joining Titia and Clarity for a rendezvous later in the summer. The pictures are of her at our mooring on July 4, the day after her rig was stepped. I'll send the sailing shots from her trials after next week. 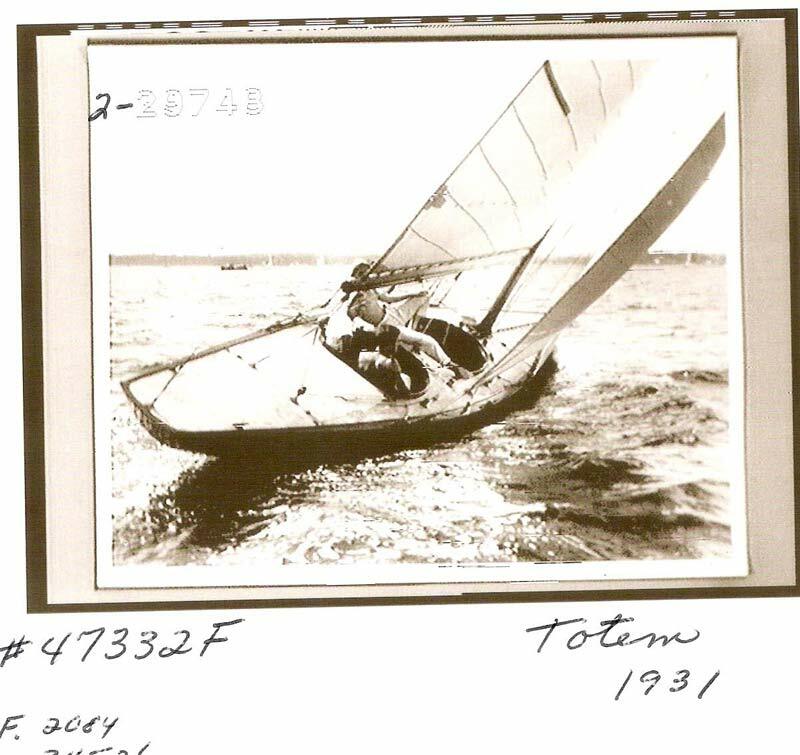 "As I belong to the National Yacht Club , I have had the opportunity to speak to some old timers who remember Totem being yellow. Today she is traditional white in a west epoxy covering. I was also told the inserted cockpit and cabin may be from a shark done by George Cuthbertson of C&C Yachts around 75-80 . That may have helped her survive all these years. I purchased her from John Livingston out of Belleville, where she was drydocked for a few years. 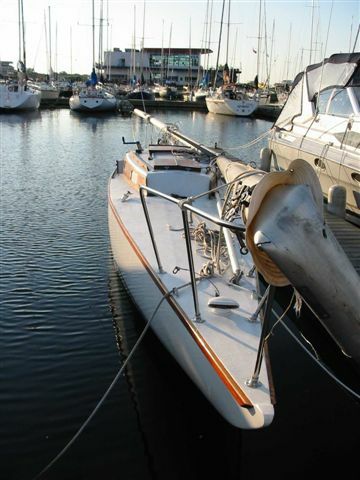 After a friend and I, with the help of a local gentleman, got her ready for launch in June 2001, my father (John Thomson) and I proceeded to sail her back to Toronto. Along the way we ran aground in Presquisle Bay (afterward I found out in French, presque means almost or nearly and isle is island) at around 7 oclock at night. Consequently, we found we were taking on about 10 gallons of water every 10-15 minutes . 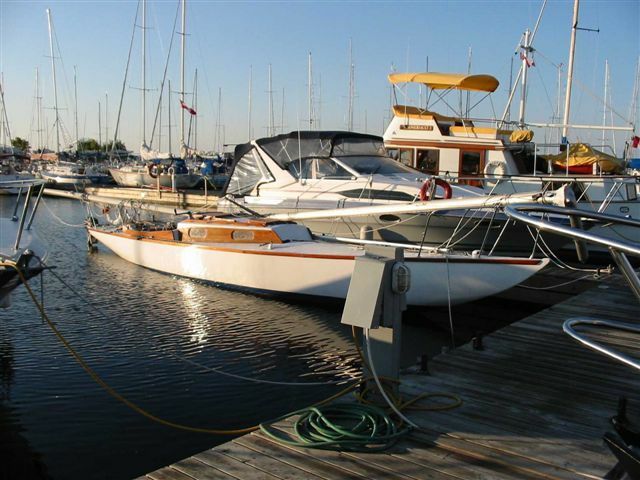 As Murphys law would have it, the electric bilge had broke when we needed it, the cell phone was dead, and we sailed to Cobourg on an extremely unforgiving, dark and cold Lake Ontario. We finally arrived to a familiar face my good friend Jim at 2:00am. 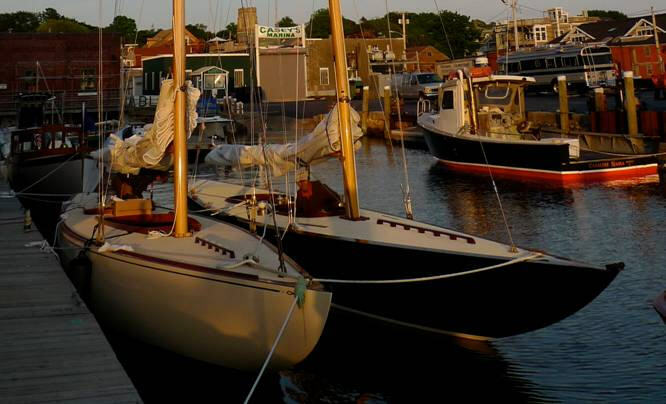 The next day we managed to take her to Wiggers Marine for repairs, where we picked her up a week later, sailed to The National Yacht Club where we recounted our story over an excellent tasting pint."